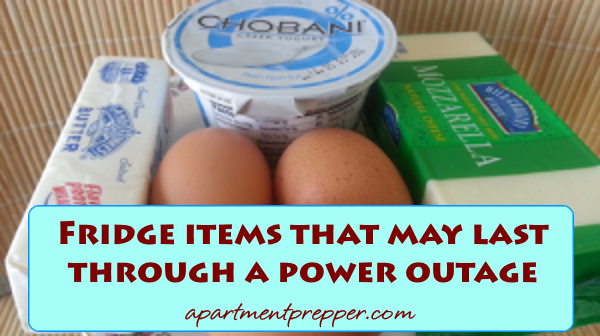 After a power outage that lasts for a few hours, many people toss out everything that was in the refrigerator. I always toss out milk, leftovers and meats. However, not everything in the fridge spoils right away and there are several items that stay shelf stable. Eggs – Most people store eggs in the fridge especially in the U.S. In England, grocery stores keep eggs on the shelves and not in the refrigerated section. So if you have a power outage that lasts for eight hours or even more, the eggs should still be safe to eat. To test if an egg is still fresh, place an egg in a bowl of water. If it sinks, and sits on its side, it is fine. If it sinks and stands on one end, it is not the freshest, but still safe to it. However, if it floats then it is no longer safe to eat. Before a predicted emergency such as a hurricane, be proactive and preserve eggs by coating them in mineral oil – I tried this and the eggs lasted on the shelf for several months. Salted Butter – I’ve kept a bar of salted butter in a covered dish outside the refrigerator overnight so it can soften for use with toast the next day, and it has never spoiled. The high fat content/low water content of butter keeps bacteria from growing rapidly. The salt content in the butter gives it a longer shelf life, but unsalted butter will spoil quickly. Condiments with vinegar – Hot sauce, ketchup and mustard contain vinegar and will stay useable after several hours being unrefrigerated. In fact, many people keep these items in the shelf, with no ill effects. Soy sauce – I have a friendly argument with one of my in-laws about this: she keeps her soy sauce in the fridge, because “the label says so.” I have never kept mine refrigerated, and it has never gone bad on me. Hard cheeses – Cheeses with a hard consistency like cheddar or swiss cheese will not spoil right away. Also, Velveeta and other processed cheeses should be fine. Soft cheeses like cream cheese, cottage cheese should be tossed. Fruits and vegetables – Some fruits, like strawberries, peaches, watermelon will get moldy very quickly without refrigeration. But fruits like apples, oranges, lemons and limes will keep well even if left out. Tomatoes are also better left out of the fridge. Herbs – You should be able to tell right away if the herbs that were in the crisper have gone bad. Green onions, mint, basil and other stems can be set in a jar of water to lengthen their freshness. Your results may vary according to food freshness and length of power outage. Use your best judgement when you check your fridge contents. When in doubt, throw it out. What fridge items have you found to last longer than expected? Salted butter lasts A LOT longer without spoiling than most people think. It’s common practice at our house to leave the butter dish on the dining room table or kitchen counter. As I type this, I can look at about a half-stick of butter that has been on the table in a covered butter dish for over a week as we use it. No, we’re not worried about spoilage. I’ve never run any tests (scientific or otherwise) as to longevity of non-refrigerated butter, but we’ve never had any spoilage issues. Sometimes a stick of butter lasts us three weeks … and no problems. Hi Paul, I thought it should be fine for a week, but we usually use up the stick of butter within a couple of days so. Thanks for sharing this!